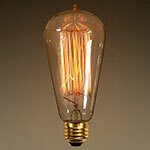 Antique replica bulbs: While many people enjoy the uniqueness of their dusky glow, others are more hesitant to jump on the vintage lighting bandwagon due to past purchases with murky results. 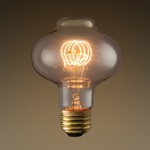 Like a proverbial comeback kid, the Edison bulb’s rising popularity is two-fold. On one hand, Edison and similar bulb shapes provide a nostalgically comfortable ambiance and on the other hand, they are not your everyday household bulbs. The nuances of vintage lighting are important to remember if you want to truly appreciate the environment that these classic bulbs can create. Comparing the glow of your antique replica bulb to the standard bulb in your bedside table is like comparing tangerines to oranges, they are both orange and round but taste different. We have written about the differences in brightness before. In our article, Are Edison Bulbs Bright Enough?, it is explained that the beloved antique gleam has a lower brightness and color than today’s standard incandescent light bulb. 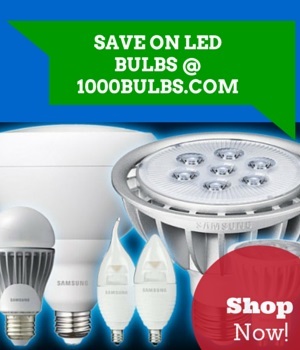 Even though a replica bulb—whether it be an incandescent or LED—might be comparable to your household bulb, the Lumen output (i.e. brightness) is not the same. Most lighting in contemporary homes is a cheerfully warm white, 2700K color temperature. 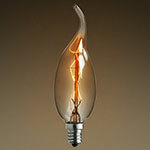 The reproduction of a vintage bulb is meant to imitate its predecessor’s modest hue, ranging from 1800K to 2400K, a decidedly yellow or orange color that is well below what is considered acceptable lighting in modern residences. For that reason, when you see a replica bulb think of it like a candle, providing a little extra light; it is not meant to be your main source of illumination. 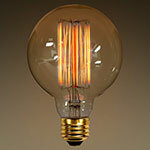 The retro style of vintage bulbs is a pivotal selling point. In addition to their candlelight color, the notable swirling or crisscrossed filaments in bulb interiors lend a handcrafted charm to your light fixtures. Many antique reproductions also feature an amber tint, boosting the well-known honeyed glamour while also contributing to the aforementioned contrast in color and light output. Consequently, the dark-hued shine is best utilized in ambient lighting. This means these are best used as decorative lights in your living room or near your dinner table but you should not expect to cook or read by their meager light. Ambient lighting is for creating a certain atmosphere, which Edison bulbs and their siblings are well-suited for, while brighter task lighting is required for things like homework or the soufflé you are determined to master. 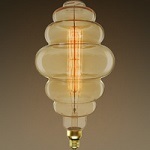 You can find many of the most common and recognizable vintage light bulb shapes in antique replica styles. Featuring an oblong shape, Edison Bulbs typically have a medium (E26) base and are one of the most recognizable antique bulb shapes. Victorian bulbs are shaped like common household A19 bulbs and usually feature a medium E26 or candelabra E12 base, allowing you to place these bulbs in fixtures that use traditional bulbs. Globes have a round, ball shape and are available in various sizes ranging from G8 to G40 light bulbs. Providing a warm glow, decorative chandelier bulbs are a good choice for an entryway chandelier or in an antique wall sconce. 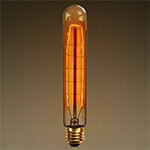 Suitable for a wide variety of lighting applications, radio style bulbs mimic the look of bulbs used in early 20th-century lighting and usually have a medium base. 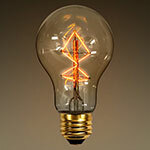 Tubular bulbs are shaped like the radio style bulbs but are taller, ranging from about 4 to 8 inches, and are popular in pendants, chandeliers, or custom lighting projects like steampunk lamps. Oversized bulbs are at least 12 inches tall and can be any shape, making these bulbs a popular choice for antique pendant lights. Specialty bulbs come in unique shapes including lanterns, gemstones, and bee hives. Besides various convenient shapes, the distinctive filaments also come in several types of windings. 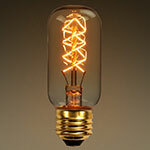 For example, 1000Bulbs.com carries vintage reproductions with filament windings like spiral, quad-looped, hairpin, diamond, and a delightful crisscross pattern known as “squirrel cage”. If you include the tint—which can be amber, slightly amber, or no tint at all—you have a vast number of possibilities. Whether you switch to energy-saving LEDs or stick with tried-but-true incandescent likenesses, we welcome your thought-provoking questions, insightful comments on Lumen distribution, or even “puny” lighting jokes in the area below. You can learn more about vintage light bulbs and other lighting topics on our blog or check out our Facebook, Twitter, Google Plus, LinkedIn, or Pinterest as we share amazing and crafty lighting. Contact our captivating team of customer service representatives, who are repeatedly thrilled to offer the know-how for your inspired lighting projects as well as empathic solutions for those electrical mishaps. Original post by Ashley Hunter. Additional information added by Jordan Loa, Devin Davis, and Angela Rogers. Most recent update on 2/19/2019.